"A friend lent me your book 'Breath of the Cosmos'. It takes my breath away." 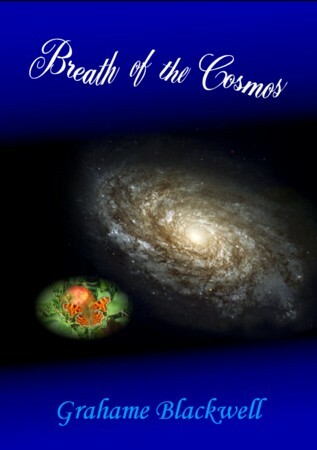 "I have greatly enjoyed reading and absorbing the content of 'Breath of the Cosmos'. Your use of language, style and format shows a keen perception of the joy of communication, the love of poetry and the gift of presentation. I shall treasure this book the more because I have made notes on the text throughout as I have discovered and, I suspect, will continue to so do, each new delight. Do not stop writing now. You have many special gifts and there are many, many people who will soon be waiting for more of your work." Shirley Day, English teacher (retired), Kent. "We have not heard the relationship between spiritual perception and science described so beautifully before as it was by you – two sides of the coin. Thank you for a wonderful evening." This book portrays the underlying structure of the universe in a flowing poetic style, illustrated on more than 40% of the pages by colour backdrops of photographs or artwork. It uses a cursive font and layout that further emphasises the message of the text, conveying a new concept on each double-page spread. The presentation style is aimed at communicating deep truths in a way that resonates as it informs the reader. The book uses examples drawn from nature to show the outworking of fundamental scientific principles in our everyday lives. It has been described by those who have seen it as 'inspirational', 'speaking to the heart as well as to the head'. The book covers such subjects as: the nature of matter; the nature and effects of light; the causal mechanisms of the flow of time; the concept of 'place'; gravitational effects and the holographic universe; the role of mind and consciousness in the universal process. All of these are described in a way that's totally different from any book that you may have read before. Certainly it's a million miles from any science book you've ever read - see comments from other readers on the left of this page. The ideas presented in this book are based on the findings published in the book 'Tapestry of Light' (click here for details) and further developments on from those findings. A workbook is in preparation, to accompany 'Breath of the Cosmos', expanding on the science behind the concepts touched on in each double-page spread. Watch this site for further information.